The IBM Continuous Engineering Connector for IoT technical preview is now available for download here on jazz.net. Learn more in the User Guide. Discuss it with us in the Jazz.net forum (using the IoT tag) and follow us on Twitter at #CE4IoT. Why Continuous Engineering for the IoT? The Internet of Things is gaining momentum, and we see lots of learning, playing and experimentation. That’s good! And that’s why we’ve made it easy to get started with the IBM Watson IoT Platform. Eventually, experimentation leads to prototypes, and prototypes lead to development of real IoT solutions that are sponsored and funded by executives and designed by development teams to have business impact. Perhaps the goal is to optimize operations, increase customer engagement and loyalty, or open new revenue streams and business models. There is potential for a far faster innovation loop as insight from IoT systems in operation becomes available very quickly to business and engineering teams. Business leaders are recognizing the potential for market disruptions, and they know that if they are not the disruptors in their industries they will be disrupted themselves. Being fast to market, which is challenging in its own right, is not enough. IoT solutions that interact with the physical world through sensors and actuators can cause serious harm, financial loss, or reputational damage if the solution performs incorrectly. The potential for harm is greater from IoT solutions than from typical mobile or IT applications, since the devices are interacting with and in some cases directly changing the behavior of things in the physical world. IoT solutions are typically systems of systems composed of many components, each potentially developed by a different team or supplier, with dependencies on systems and services operated by others (who have their own agenda) to enable critical attributes of the system. System boundaries might be less clear and the system is more likely to evolve in ways unforeseen by the initial designers. All this produces new kinds of hazards and risks. Dependability must be designed in. Managing change is one of the primary purposes of IBM’s continuous engineering solution, which enables collaborative interaction across the whole team and across the whole solution delivery lifecycle, helping teams to maximize the positive impact of change while minimizing its negative impact. Effective engineering practices are key to effective realization of the design and in a larger sense, the business vision. Enterprise-scale IoT solution development requires enterprise-appropriate systems and software engineering practices. New paradigms that exploit the IoT are likely to emerge: for example, connecting engineers directly to insight about their products in operation opens up the possibility for a whole new change management paradigm driven by quantified operational feedback. We demonstrated a simple scenario making use of IoT analytics at the recent IBM Continuous Engineering IoT Conference (ICE) in Long Beach, California, (you can see a summary in the video on the CE4IoT Connector page). Design for analytics: Requirements define the rules, events and summary statistics that the system needs to capture. Requirements include assumptions about the operating environment and system behavior in operation. Analytics for design: The IoT solution creates alerts for the engineering team when design assumptions are not being met. Problem determination resolution: It’s faster when engineers combine design and operational IoT analytics (we used a real-time alert and custom dashboard backed by historical operational data). (with special thanks to our friends at Persistent Systems Ltd, who created the custom dashboard and the utility that opens Jazz work items from a Node-RED flow in IBM Bluemix). This connector places objects in IBM Rhapsody Design Manager that represent IBM Watson IoT Platform resources, enabling the development team to include these IoT resources in change management, impact analysis, planning and release tracking, requirements-driven development, requirements-driven testing, test-driven development, designing for IoT analytics, and other development practices. 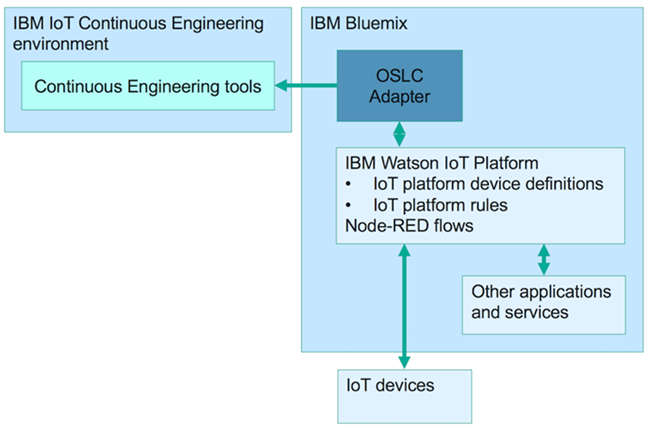 Making use of OSLC links to requirements, tests, work items, and other design elements, the continuous engineering tools can provide a design view of the IoT solution. And the IoT objects in Design Manager include links to the actual resources in the IBM Watson IoT Platform and Node-RED, simplifying navigation between these environments. I invite you to learn more in the CE4IoT User Guide, discuss it with us in the jazz.net forum (using the IoT tag) and follow us on Twitter at #CE4IoT. Read more about optimizing design for the IoT and designing for analytics. Learn more at ibm.com/iot and try the IBM Watson IoT Platform for free. And please let us know how you are using (or want to use!) continuous engineering practices to design and build your IoT solutions.